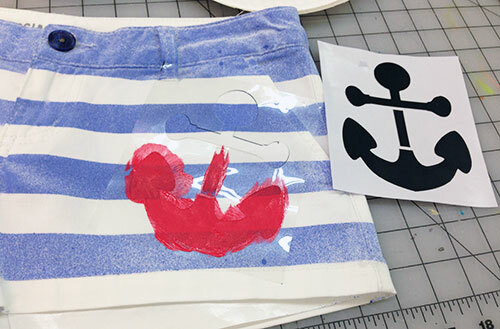 We always have something new and exciting going on here at iLoveToCreate and instead of coordinating the craft designer projects and schedules like I normally do, I got to be the designer for a day! 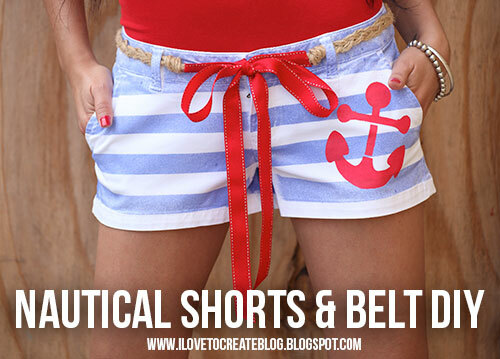 The entire design studio was challenged to create a pair of DIY shorts and I got to join in! 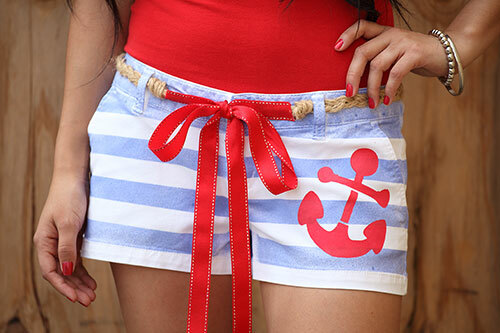 Since I love all things nautical..anchors, lobsters, ropes, seahorses, etc., I knew I wanted to add that flair to my shorts! 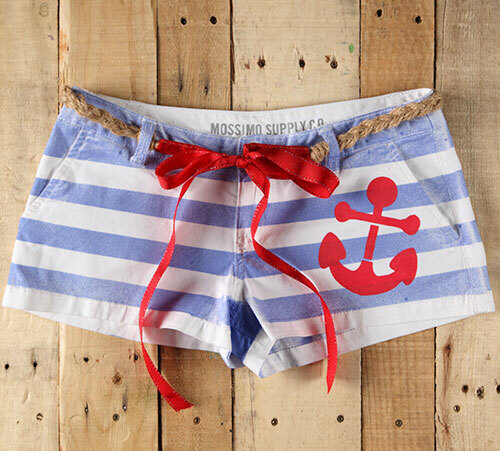 Here's how you can unleash your inner Gilligan and make your own sea-worthy pair along with a super easy-to-make rope & ribbon belt! 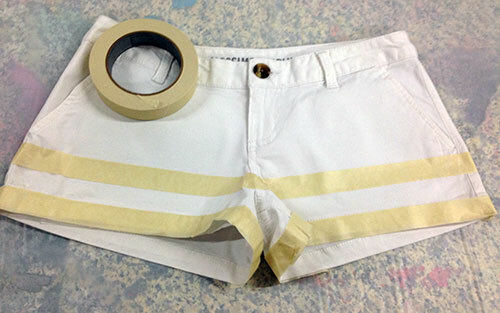 Tape off stripes on the front of the shorts using masking tape. Now add in some paper towels in between your shorts so that the spray won't go through. Now you are ready to spray. Lightly mist the spray 10-12 inches above the surface until you are satisfied with the coverage. Let dry for several minutes before you peel off the tape. Remove the paper towels and peel off the tape to reveal your design. Flip over and repeat the process on the back. I chose to tape off the pockets on the back of my shorts. Let everything dry thoroughly. 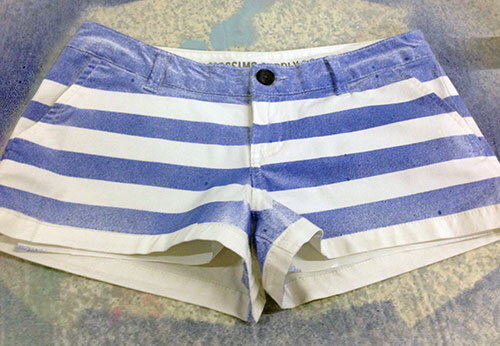 Squeeze your Soft paint onto a plate and peel off your stencil and apply to the front of your shorts. It's sticky so it automatically adheres. 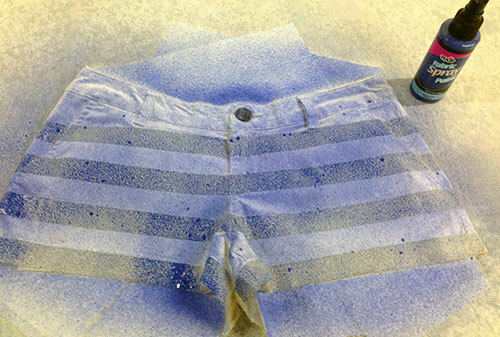 Place a piece of paper towel again in between the shorts so the paint doesn't bleed through. Load your red paint with a foam brush and pounce off excess onto your plate. Now start pouncing color inside your stencil. Once you are done, peel off stencil to reveal the design. Let dry. For the belt portion, I simply knotted and braided six strings of hemp twine together. 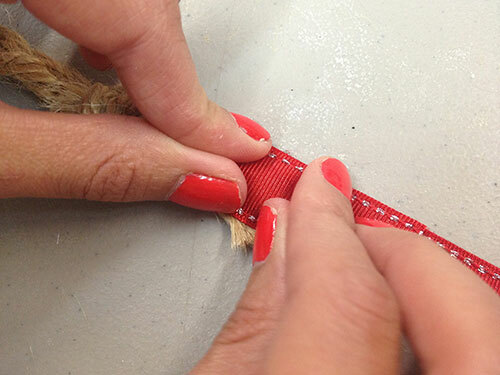 Leave a little tail above the knot as you will want to attach the ribbon to it in the next steps. Braid until it is enough to wrap around your waist and meet the front two belt loops. You don't want the braided hemp to completely wrap around your waist, as you will be adding the ribbon for a decorative closure in front. 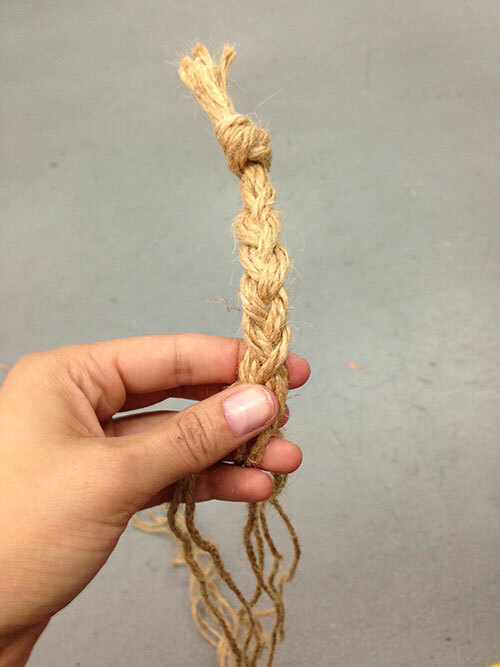 Once the correct length, finish off with another knot. Cut a piece of ribbon about 2 feet long. 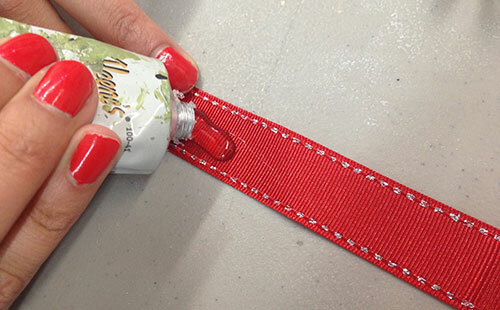 Apply some Aleene's Super Fabric to the end of the ribbon. Oh and please ignore the gnarly tube of glue I used. It's the only one I could find in the studio! Now press the tail of the braided portion of the belt and press into place. 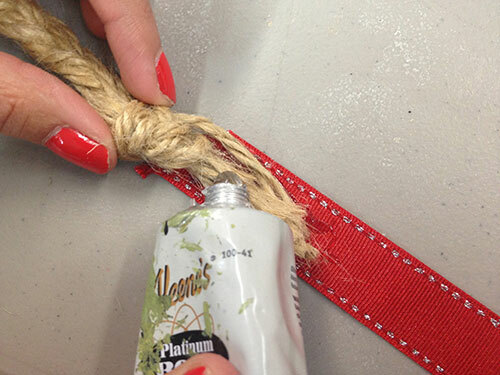 Add a little more of the glue to the top of the twine. Cut a 3 inch piece of the ribbon and press into place. 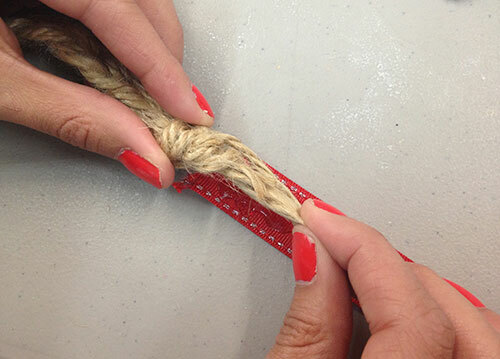 Use scissors to cut off any excess hemp twine that may be peeking through. 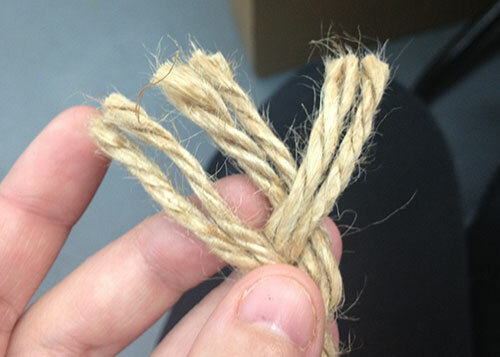 Now repeat this for the other end of the tied twine part of the belt. Let dry thoroughly. And here's the completed look! I think I need to go sailing now or at least make a trip to the beach. The back turned out super cute too. Thanks for joining me for this fun project and please DIY on the FLY projects and videos below for iLoveToCreate! Happy painting!